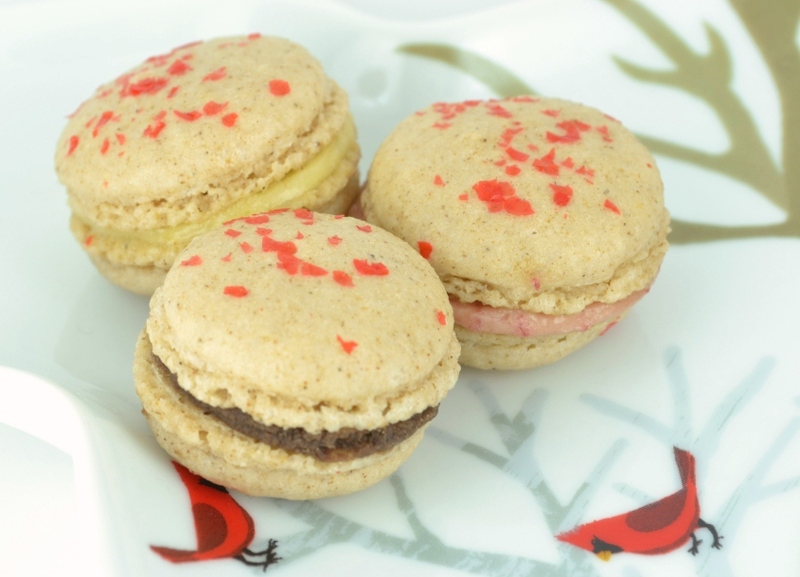 Wild Serendipity, a local baker in Saskatoon, was kind enough to share her Macarons recipe with the world on her blog. Click here for the original post. She has learned the craft at the famous Le Cordon Bleu in Paris, so she knows what she is talking about. I wanted to try her recipe because it is slightly different than the others, and let me tell you, it worked like a charm. Since I got a bunch of gingerbread spices from Germany, or rather, I bought them and sent them to myself, I figured I use them. Not just for gingerbread, that is obvious, but for other things too. 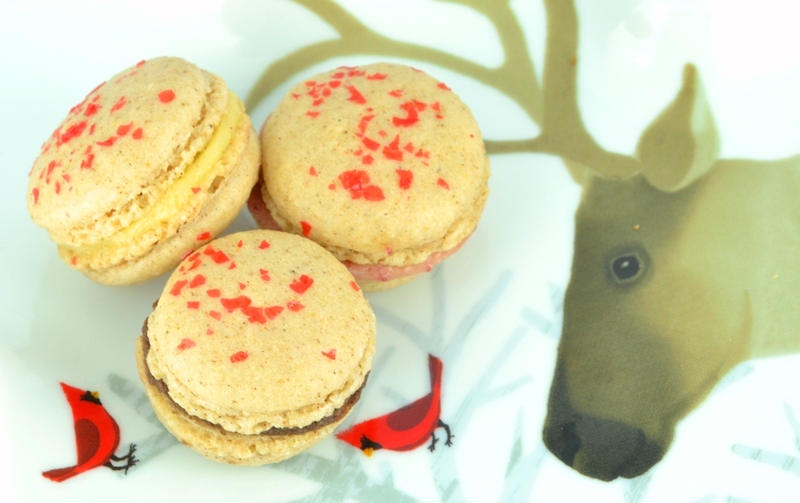 Why not a Christmas Macaron? Gingerbread is a typical Christmas cookie in Germany, so why not mix that with these little delightful desserts? 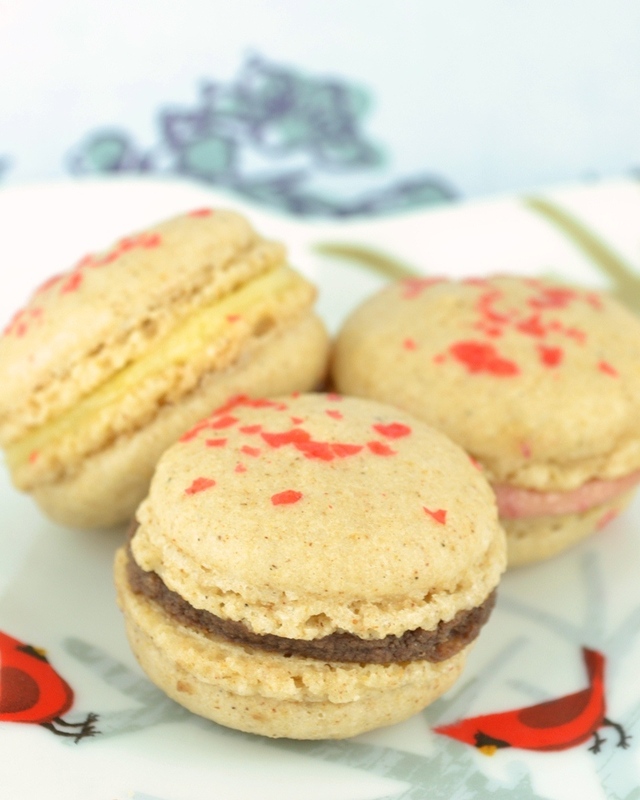 Michelle uses a rather large batch for her macarons, I scaled the recipe down to match my humble needs for two people. Tip: Aging your egg white is fairly simple. Leave it out, covered, on the counter for about 2 days or for several days in the fridge. Michelle puts her’s in the freezer, read her article for that please. Her suggestion for the almond flour/ground almond is really nice and I think it helped a lot. I combined half ground almond and half icing sugar and put it in the food processor. I have a very little one, so I always need to make things like these in several steps. Now process this mix until it starts to stick to the bottom somewhat then scrape it off and repeat. I think I did that 2 or 3 times, then sifted it through and did the other half. Make sure your egg whites are at room temperature before you beat them. When slightly foamy you should add the cream of tartar and beat until they start to form peaks. Add half the sugar, beat more and add the rest of the sugar. Slowly turn your beater to a higher speed and keep beating until you have stiff peaks. However, me sure they are not too dry, e.g. over beaten then transfer to a large bowl. I use a plastic one what works well for me. Combine the almond flour/icing mix with the spices and sprinkle on half over the egg whites. Use a spatula to incorporate both but carefully, add the rest of the almond flour when the first half is almost combined. Scrape along the side of the bowls and keep mixing until everything is combined. Now, make a flow test to see if you are good to go. If the mixtures runs down the spatula in a flowing move, forming a ribbon you are good to go. If now, keep mixing but make sure you are not over mixing. Once you have the right consistency, transfer to a piping bag with a large round time. 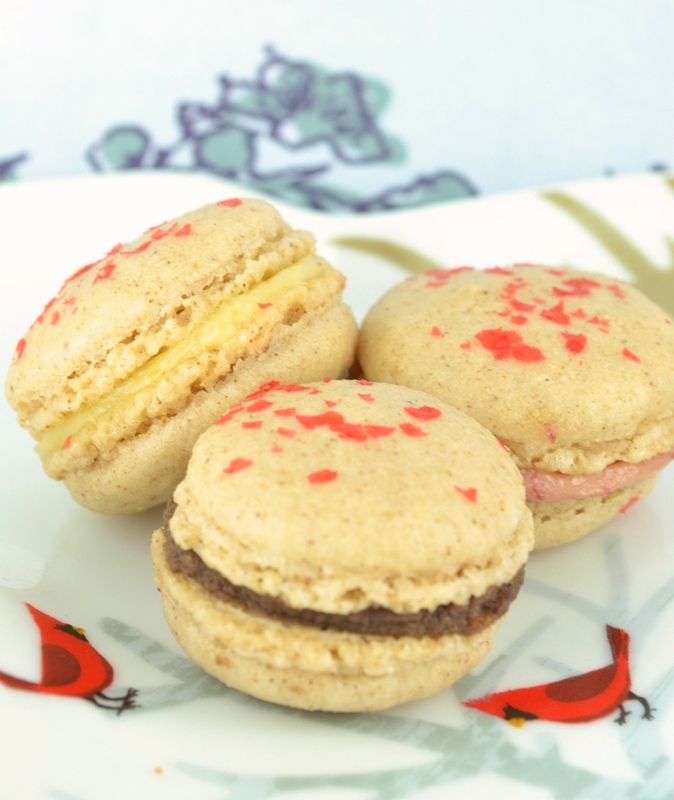 Line your baking sheet with baking paper and start pipping macarons. I suggest that you hold the bag on a 90°C angle and then just squeeze, the mixture will spread by its own. Don’t make swirls or anything like that like you would for cupcake decorations. When you piped all macarons, tap the cookie sheet to make sure air bubbles are released. Let them rest until a slight skin has formed, about 30 min. Bake at 180°C for 10 to 15 min, it really depends on your oven and you should check after 10 min. Lightly touch one of the macarons and see if you can move the top. If so, bake for another minute and try again. 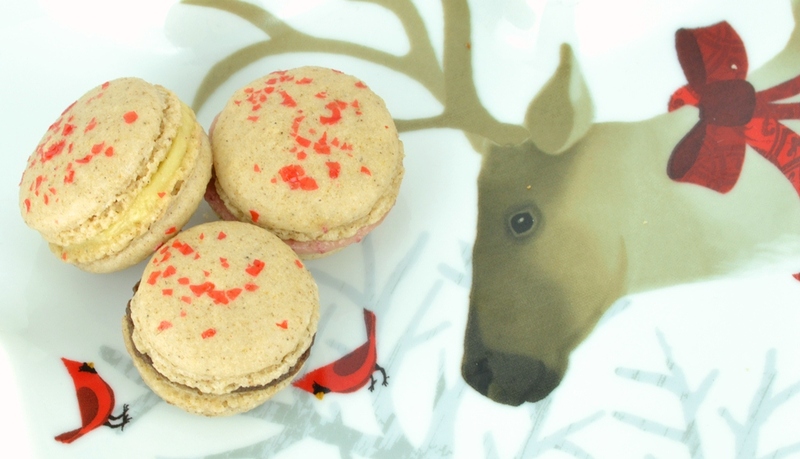 If it doesn’t move you can remove the macarons from the oven. Let them cool out and then store them in an airtight container until you make the filling. Again, I had to scale this down because I knew I would never use the amount she makes. Making this batch with such small amounts is a bit tricky but possible. First of all you need to bring the honey to a boil. While you wait for that you should beat the egg yolk until light. Then pour half the honey down the side and keep mixing while you do so. Mix until the bowl is completely cooled down. Cut up the butter and add piece by piece. Finally, add the rest of the honey, which should be room temperature by now. You will have a nice creamy mixture. Make sure you use similar sized macaron shells when putting them together. I added some as is to the macarons but then also added some raspberry yam (without seeds) to the buttercreme. I also had some Chocolate Ganache left over, which I used for some. Chocolate and raspberry and gingerbread go nicely together. 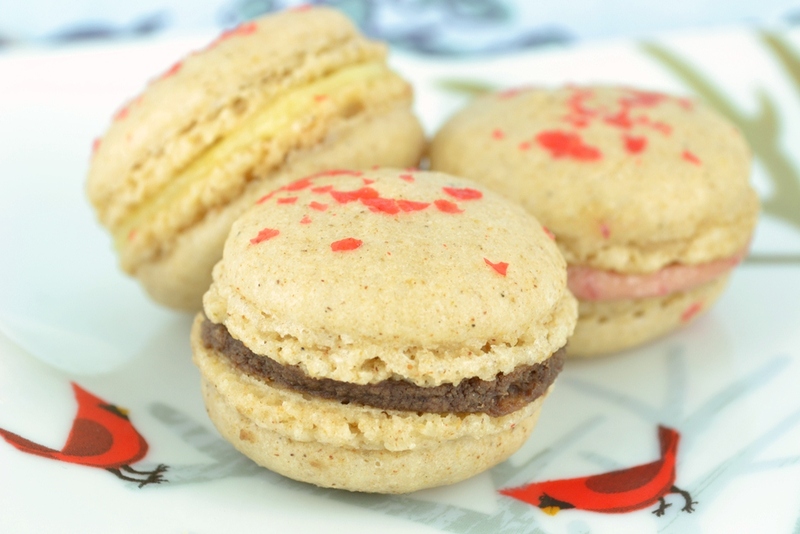 Posted in Little Treats, Macarons and tagged almond flour, baking, buttercream, Christmas, egg white, egg yolk, gingerbread, Macarons, raspberry yam, recipe. Bookmark the permalink.